The successful passing of the Jump & Phil’s baton to the Powells makes a lot of sense, as they know the place nearly as well as its founders. Lawrence tended bar here for over a decade, and Lauren waited tables for four years. The couple met here, married, are now raising their darling preschooler Lola, and when the time was right, knew they were as ready as they would ever be to take the reins. 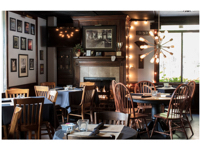 The creative-minded couple appreciate the history at Jump & Phil’s, and are thoughtfully realizing their vision of taking the dining experience to another culinary level, all while maintaining the neighborly vibe. 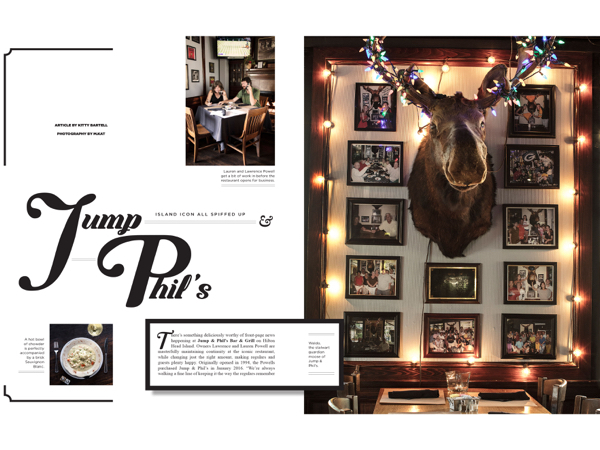 Much of that vibe has been created by the carefully thought-out changes made to the Jump & Phil’s décor. Under the watchful eye of Waldo, the stalwart guardian moose of Jump & Phil’s (be sure to ask your server or bartender how Waldo found his way here), the Powells selected a refined blue-gray palette for the walls and upholstery to compliment the worn brass finishes and warm wood throughout the restaurant, and the floors and ceiling were redone. The treasured photos honoring its history have been intentionally rearranged; one niche is all Green Bay Packers—after all, this is the local GBP headquarters; one niche is filled with signed pictures of celebrity athletes; and another shows off the authors who have spent time here. Local authors Kathryn Wall and John Maxim are regulars at Jump & Phil’s. The tables combine a soft linen tablecloth with rustic craft paper; the lighting is warm, and the effect is cohesive and inviting. Lauren and Lawrence Powell get a bit of work in before the restaurant opens for business. Homemade dressings have elevated the salads at Jump & Phil’s. “They’re all recipes I came up with through trial and error,” Lauren said. “The basil balsamic and house-made vinaigrette are the favorites. My personal favorite is the tomato avocado salad. We make our homemade pesto that’s drizzled over that, and combined with the vinaigrette, it’s really delicious.” Diners also have a choice of honey mustard, 1000 island, blue cheese, and ranch dressings; making it nearly impossible to go back to the bottle once you’ve tasted the homemade versions of these classics. “There’s been a really positive response to the salads, and the people who like them come back again, and again, and again,” Lawrence said. Fresh catch of the day served on a light bed of greens. The paninis provide another creative outlet on the Jump & Phil’s menu. Served with a raspberry mustard, Lawrence’s favorite pressed sandwich is the ham and Swiss. The caprese panini is particularly amazing: a fried goat cheese patty with homemade pesto and grilled tomatoes, dipped in the homemade basil balsamic dressing…yes, please! 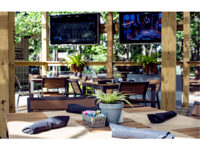 Large TV’s frame the outdoor deck, perfect for watching the Green Bay Packers! 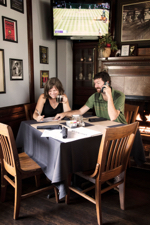 Finding their way as restauranteurs where history and creativity guide nearly every step they take, the Powells are masterfully writing the headlines of their own story, building a community of friends, neighbors, and fellow entrepreneurs, supporting each other, all while maintaining a sense of continuity and keeping everyone deliciously happy. Jump & Phil’s Bar & Grill offers service from their menu seven days a week, 11:30 a.m. to 10 p.m., with the bar remaining open until the party winds down. 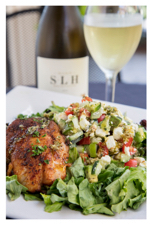 Happy Hour is Monday through Friday, 4 p.m. to 7 p.m. They are located in Reilley’s Plaza, 7D Greenwood Drive, #3, Hilton Head Island, between the Sea Pines Circle and the Sea Pines Resort gate. For more information, please call (843) 785-9070 or visit jumpandphilshhi.com.